Finding work from home jobs for disabled individuals is unique to each person's situation. Some people cannot work on a regular schedule because they never know when they will have a bad day, an episode, a reaction, a doctor's appointment, a hospital stay, or need a treatment. New statistics came out for Autism and 1 in 59 are on the spectrum – this gives us a whole new subset of moms and dads who are home taking care of their sick children. I could not work a regular job when my son was sick and I am so grateful he is well now! Having a home business gave me the freedom to stay home with him when he needed me most. When I was sick, I could not have worked at a job because I got sick from people, places and things using chemical products or coming from buildings that had chemicals or mold. I became chemically sensitive and mold sensitive – and sometimes an exposure would keep me sick for days or weeks. I've gotten a lot better – but I don't want to work in or around mold other indoor air quality problems. 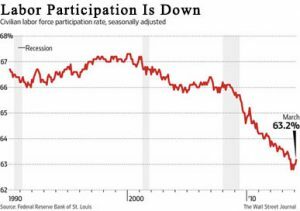 Labor participation has been declining. Is this (at least in part) because our population becoming more and more sick. While working a regular job is difficult, if not impossible, for some disabled people – you still need to make money if you have a disability. On top every day expenses – disabled people need money for the unknown – which can include, medicine, supplements, treatments, specialty doctors – and so much more. Starting a website should be the long term plan if you want to work from home- but many times there are immediate needs and people need money in the bank yesterday. Many times – when you start a website it takes 3-6 months of consistently working on your website & knowing the steps necessary to build a successful website before you start seeing meaningful income from that site. You can work from home and start earning money working from home immediately – you just have to know where to look for jobs and freelancing opportunities. If you need to make money right away and you are disabled you need to find a job that is flexible, pays well, something you can do, and where you can (preferably) work from home. I have done my best to research what I am recommending on this page but I have not tried every single site! PLEASE – if you know of anything I mention that is not 100% legit and helpful – let me know in the comments! Most of these resources are free. If you do have to pay a fee for something, please do your own research. Don't give out your bank information for credit checks. I think that seems kind of spammy and questionable and I would not be comfortable with it. I provide no guarantees of income or any other guarantee with any of these recommendations. These are resources for full time and part time jobs and freelancing opportunities – organized by job type – with links to websites with work from home opportunities. Monster.com – From the “Advanced Search” you can put “work from home” and leave everything else blank – no need to choose a location – I got over 1,000 results – you might want to add your own limitations to the search to narrow it down. You can try some other keyword searches too. You can also post a resume. Indeed.com Search “work from home” and make the location “United States” to get the most work from home jobs. I like Indeed because you can limit by salary if you are looking for a real job. For many work from home jobs and some freelancing gigs – you will need a resume. When I had to write a resume – I used resume-now.com to write the resume and then I went to my own Microsoft Word – and copied what I had made on that site. Take an audio file and turn it into text – many people do interviews, webinars, podcasts and other media that has audio they need transcribed into text for a blog or other print media. If you are good at grammar, punctuation, recognizing accents and typing – this gig might be for you! SpeakWrite – .005 to .006 cents per word average transcriptionist makes $300 a month. Top earners make $3000 a month. Somebody who takes instructions via skype, email, video or other and performs specific tasks for online business owners. A VA could be doing social media marketing, research, investigating real estate deals, writing, commenting on blogs, data entry or other tasks. Most of the time, the person doing the hiring will provide instructions and training. Entrepreneurs that are hiring virtual assistants have found a part of their business they can hire out to save them time – and they should be able to make a video teaching what they are currently doing and pass off that job. Many websites have online chat and support forums as well as email support and they need people to help with these tasks. There are tons of listings for jobs in customer service. Other places to contact about working for them: Hosting websites, domain sales, people with websites that need lots of customer support. LiveOps.com – there may be a fee for a background check – I read that in one place talking about LiveOps – but I have not seen that on the LiveOps website. You've got to have thick skin and a good script for this kind of job – but I had a telemarketing job I loved because we did have a good script, I believed in the product and that I was helping people, and there were bonuses that I hit regularly. I see outbound marketing jobs advertised all the time – just be careful you are not getting in a ponzi scheme. Use your head and only do things that resonate with you. Constant Content – has a marketplace where you can list articles for sale and a place where you can browse and choose public writing jobs. You need to pass a quiz and submit a sample. BKAcontent – No experience necessary. Complete a grammar test and submit a sample. Articles pay anywhere between $0.01 and $0.05 per word. TextBroker – pays per word – only available in the U.S. The young lady in this next video has found a way to work from home doing freelance writing jobs. She could not get a job because of chronic headaches that were making her lose her vision! She goes over why you should not look for writing jobs in “content mills” like Upwork and where she does find her jobs – as well as what it takes to be successful – she mentions applying for 20 jobs a day! She is an inspiration – and this is why I included this video. I did web design for years – which eventually morphed into a full-time plus thriving business where I could hire employees – and had hundreds of clients. I'm not sure if web design is still a good field. I think it's dying because there are so many people using WordPress and other platforms that are based on cookie cutter themes that are plug and play. I'm sure there are niches within web design that can still be freelanced out and if they are popular and needed – you could form a business around it. Find a product you believe in and sell it. There is money in sales. And you don't have to be that sleezy sales person. Many people have such a negative feeling about sales people that they would never become a sales person. If you found something that you believed in – something that really helped you – and you knew it could help a lot of people if you told them about it – wouldn't you feel obligated to tell them about it? If you would tell someone about something whether you made a commission or not – that is what you should be selling. You can do affiliate marketing with a website – or with other selling strategies. Think about products or services that have helped you and reach out to the company to see if they have an affiliate program. It is best to sell something you believe in 100%. I went to college online – and I know a lot of my professors were working from home. If you are a professor – you could check with colleges that offer online college courses and see if you can teach from home. Many people continue their education with online classes and I would look in with some of those places to see if they are offering jobs to educators. I have not been able to find any work from home teaching jobs on Alison – but it might be worth contacting them to see if that kind of thing is ever considered. I have used their online training (for free) and I have loved their courses! Translator's Cafe – where linguists and their clients come to meet – is a forum where people post jobs and look for jobs. It's free to register and looks active. Work for Apple – Apple has work from home Advisors! Work for Amazon – scroll to the bottom of the left menu and you will see “Work from Home” – as of 5/9/2018 there were 252 work from home jobs at Amazon. HomeWithTheKids.com is a work from home job board and seems legit – I checked out a lot of the links in the job board itself – if you click on the main categories – it takes you to lists of jobs. Home Job Stop is a one time (lifetime) fee of $18 – and all the job opportunities are screened and guaranteed scam free. I have seen some reviews around 2014 – saying their customer service was not what it used to be and some of the job listings were old – use at your own risk. FlexJobs has a fee of $14.95 a month or $49.95 a year and I have never tried them. Recently, I am seeing more and more of this company – I read some reviews and they are all good! Just in case you got to the end of this list and you are still looking for ideas – Here are over 60 ways you can work from home in under 10 minutes. Can You Work While Receiving Social Security Disability? National Telecommuting Institute – Founded in 1995 as a 501(c)(3) nonprofit organization, its mission is to identify and develop work-at-home jobs for home-based Americans who are physically disabled. I’m glad I could add some resources to your toolbox! It’s always good to have options. May you have all the health and wealth you desire! Thanks for posting this Heather. This article is really helpful for a newbie like me trying to get my online business started up. I will be bookmarking this and sharing it with friends of mine that are in the same boat as me. I am glad you found it useful! Thanks for sharing too! Outstanding post! You included tons of ideas and information that I or anyone can come back for future references. Thanks, Carl! I’m glad you found it helpful! I can only say congratulation on your post. This post has so many valuable information that it is maybe overwhelming. This post is valuable not only for disabled people but also for anybody who wants to know more about starting a home business. You have given a LOT of resources! I am going to bookmark this page, and when I can give it some time, I am going to go thru the links and see if I can find some options for myself. Thanks for the wealth of information! What an awesome compliment. Thank you. Glad I could help. I’ve used Fiverr in the past, thinking I could freelance on there, but found I just couldn’t compete. People were offering to do things for $5 or $10 and there’s no way I could compete. That’s because most of not from North America, so that $5-$10 USD is like a week’s wages in their country. But you could actually use this to your advantage, as you could create a business model where you get the customers and then you go to Fiverr and find the people to do the services. You Charge $A from the business and pay $B to the Fiverr people and you net a profit ($A – $B). You absolutely could do that! Great point and thanks for adding that to the mix! The way I have used fiverr in the past is when I am being paid for a larger design project and I need a graphic or a video – I can go to fiverr and get it for $5 or $10 and use that in the larger project. Heather I am so glad you are offering a post like this for folks who are disabled, that is fantastic. I know there are people who really want to work and earn a good living and you have come up with some awesome ideas in this post. There are a plethora of options for people who need to be able to work from home. I especially like the Fiverr and Upwork options. These are great for creative people. Thanks again, I appreciate what you are doing!! Keep up the great work. Thanks, Steve! I’m glad you liked the post! Hi Heather, all I can say is wow! A great post with so much information… thank you for sharing! You have provided so much value in this post and I am sure many people will find it helpful. I have bookmarked your site and will be returning again to read more of your interesting and valuable articles. I used to do web design, however, I also feel the future is not so bright for web designers as it is becoming very easy for people to create their own sites using WordPress, Blogger, and other simple to use platforms. Congratulations on a great site, keep up the good work! I’m glad you liked it. Funny that we have similar backgrounds. Nice to connect and share how we both morph from one niche to another as the world changes. Thanks for the compliments! What a great list! I’m in need of extra cash so I will look more into what you’ve listed. Also, I really like the ratracerebellion website. Great share. Thanks! I am glad you found something you can use! Please, let me know how you do!